Set the CPU and Memory to half of what you have. This container takes very little resources ( less than 1% of CPU and RAM in my case) , but you can set the upper limit to 50% . You will need an IP address to access your transmission webfront. For this set the network on Bridge mode. Set it to DHCP if you have a DHCP server,or Static if you want to have a Fixed IP. You need to mount 3 directories. /config holds your configuration files. /watch is where you place new torrents. You can skip mounting the config directory and it will by default create one for you. 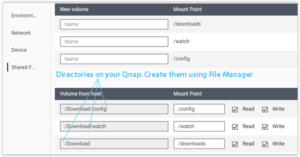 For /downloads you would always want to mount a directory on Qnap. I use /Download directory on qnap for downloading so I specified this. Further I created watch and config directories under download . Run the container and you can see its IP address in the console. In case you don’t see the IP address, you can click on terminal and run ifconfig command. It will open a new window with the output and you will have the ip address. That’s all there is to running transmission on your Qnap. In next tutorial I will show you how to install couchpotato using Docker container on qnap.